The undisputed kings of grind PIG DESTROYER have added a new member to the fold. Adam Jarvis' cousin John Jarvis has joined PIG DESTROYER as the band's first bass player. John will make his PIG DESTROYER live debut at the Housecore Horror Film Festival — curated by Phillip Anselmo (PANTERA, DOWN) — in Austin, Texas on October 27 at Antone's. 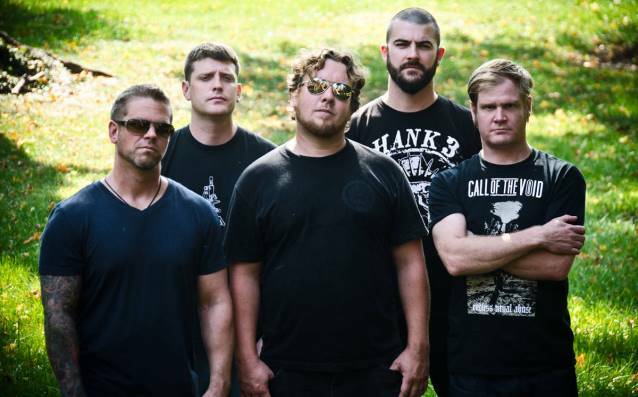 John commented on joining PIG DESTROYER: "It's an honor to be a part of PIG DESTROYER. I'm looking forward to making new music with the guys, as well as adding some 'low end' to the older material live. "After being able to see every incarnation of the band live in the past, I can honestly say that the guys are at the top of their game. "See you at Big Phil's Housecore Horror Fest!!!" Founding member and guitarist Scott Hull added: "Having John come into the band adds the ability to expand musically into new territories that we haven't explored yet. "For many years, we haven't had a bass player or second guitarist because, as JR once put it; 'mo people, mo problems.' But a band is a living organism. Change is good. New blood. New energy. "We've had great experiences adding Blake before 'Phantom Limb' and Adam before 'Book Burner'. Both additions to the family have had huge positive impacts on the band. "We'd thought about adding a bassist for some time, but it always seemed like it would be more of a hassle than anything else. "John has come in like a soldier and has mastered everything we've thrown his way. "We're excited for you guys to hear how the older material sounds with an expanded low end and can't wait to get to work on new material." PIG DESTROYER released its fifth studio album, "Book Burner", last October via Relapse Records. The CD features 19 tracks with a return to the band's raw, misanthropic sound. "Book Burner" is available on multiple formats, including CD, deluxe 2xCD, LP, deluxe 2xLP, cassette and digital.